Check out more of Josh's projects here. New York, New York – March 24, 2011 – Manhattan Edit Workshop (Mewshop), the cutting-edge authorized digital training destination for post-production and content creators, is pleased to announce its sponsorship of the 10th Annual NAB SuperMeet, as well as its participation in the NAB Post Pit: a gathering of users, rock stars, and creators of the most savvy and dynamic post-production software around. As official sponsors and presenters of the creative community’s most popular gatherings, the 2011 NAB SuperMeet and Post Pit, Mewshop brings its trend-setting DSLR and filmmaking training methodology to Las Vegas. From its flagship Six-Week Intensive Workshop to American Cinema Editor’s EditFest NY co-produced by Mewshop, the NYC training destination prides itself on creating invaluable opportunities for cinematographers, videographers, editors, and filmmakers of all levels, enabling them to dive deeper into their craft and, in turn, enhance the entire post-production community. Each year, the Las Vegas SuperMeet aggregates well-known Adobe®, Apple®, and Avid® editors, digital content creators, and DSLR filmmakers from around the globe to explore the latest industry trends and innovations. The SuperMeet offers a perfect setting for attendees to chat one-on-one with Mewshop about its unique digital training curriculum. Mewshop will be showcasing its entire repertoire of training and event highlights, including workshops in the latest industry trends, technology-specific certification, customized corporate training, the Six-Week Intensive Course in the art and technique of editing, and its co-production of American Cinema Editor’s EditFest NY. The NAB Post Pit brings together top users and creators of the most savvy and dynamic post-production software available. During the day, post-production geniuses take the stage to share hot and exclusive tips, while at night – no matter your platform of choice – attendees can join together with fellow pros for a uniting reception. Mewshop Founder and award-winning filmmaker and editor, Josh Apter, will be on-hand at the Post Pit to discuss “Recording Great Sound with DSLR and Digital Cinema Cameras.” His “Ears-on” presentation will demo the best techniques for recording location sound with today’s HD-DSLRs and compact digital cinema cameras, including Panasonic’s new AF-100. Topics covered will include mic selection and placement, mixing, booming, external recorders, outboard field mixers, and managing audio sync in post with amazing new tools like Singular Software’s DualEyes and PluralEyes. The Las Vegas SuperMeet will be held at the Bally's Hotel Event Center on Tuesday April 12, 2011. Doors open at 4:30 p.m. For information about the event, or to purchase tickets, please visit: http://www.supermeet.com. The Post Pit will be open throughout the NAB showcase, from April 11 – 14, 2011. The pit is located in the South Lower Hall, on booth number SL9126. For more information about the Post Pit, please visit:http://www.nabshow.com/2010/exhibits/post_pit.asp. 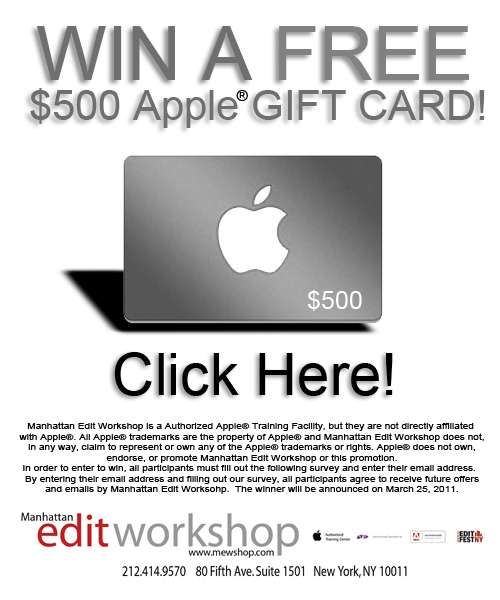 For more information on Manhattan Edit Workshop, please visit www.mewshop.com, or visit us at booth C11022. To book a press appointment with Manhattan Edit Workshop at NAB 2011, please contact Cara Zambri at cara@zazilmediagroup.com. Manhattan Edit Workshop was founded in 2002 with the goal of providing cutting-edge editing instruction on Apple, Avid, and Adobe platforms. Mewshop's signature Six-Week Intensive is a jump-start for anyone looking for a career in editing; weekend and one-week courses introduce and solidify core-editing concepts. Corporate and group training is offered through a customized curriculum, either in-house or on-site, for professionals that are eager to learn a new skill or to build on existing ones. The facility's focus on small workshops, highly skilled and certified faculty, and a results-oriented curriculum has quickly won it the reputation of being New York's premier post production teaching facility. 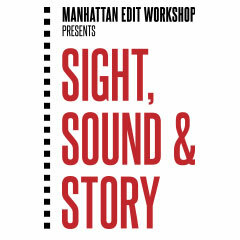 For more information on Manhattan Edit Workshop, please visit: www.mewshop.com. * Mewshop offers student loans for courses totaling more than $2,500. Students may take a combination of courses together, or a single course that equals that amount. Please call 212-414-9570, or email jason@mewshop.com, for details about our available payment plans. Whoosh! A producer and her editor search for the perfect sound effect. iOS Application Demo at Tekserve - March 21, 2011 - 3PM! Have you ever tried to learn how to develop your own app? Have you spent time going through the online materials, only to find yourself more confused than when you started? In this demonstration we will show you the basics of how to design and develop your own app for the iPhone, iPad, or iPod Touch. We will cover the basics of iOS development with a review of Cocoa Touch, the framework for rapid development, Xcode, the Mac Integrated Development Environment (IDE) for iOS development, and Interface Builder, the graphical user interface development environment. Come and see how to get started on your path to developing apps for the iPhone, iPad, or iPod Touch at Tekserve. Monday - March 21, 2011 at 3pm. Register Here. This is a free event that will be held at located at Tekserve - 119 West 23rd Street New York, NY 10011. Cameron L. Fadjo is an instructor of iOS/Objective-C 2.0 and Java development at Columbia University's Teachers College. A former Business Specialist with Apple and product specialist for Native Instruments, GmBH, Mr. Fadjo has over seven years of experience as a corporate trainer and leader. He holds a certification as a teacher in the state of New Hampshire and is a certified professional in Logic Pro 8. In addition, he holds a Bachelor of Music (B.M) in Music Synthesis from Berklee College of Music and an M.A. (Instructional Technology and Media) and Ed.M. (Cognitive Studies in Education) both from Teachers College, Columbia University. While he is pursuing his PhD from Columbia University, Mr. Fadjo is the lead researcher on a project using innovative and experimental ways to teach computer science and is the lead developer on The Farm, an iPad app designed to improve reading comprehension for elementary school children. Take Our Survey For A Chance To Win A Free $500 Apple Gift Card! FCP Quick Tips - episode #183 from Rob Imbs on Vimeo. New York, New York – MARCH 15, 2011 – Manhattan Edit Workshop (Mewshop), the cutting-edge authorized digital training destination for post-production and content creators, has announced that it will exhibit at the National Association of Broadcasters (NAB) convention, held in Las Vegas, NV from April 11-14, 2011. Stationed at the B&H Photo, Video & Pro Audio booth (C11022), Mewshop will be promoting its unique and versatile digital training curriculum and destination-based methodology. From onsite corporate training, to workshops in the industry’s latest trends like DSLR, to their flagship Six-Week Intensive Workshop, and EditFest, one of the industry’s hottest editing and post-production conferences, Mewshop offers a little something for every post-production scenario. Custom Workshops: The Digital Cinema/DSLR Workshop guides students through hands-on exercise and demonstration in camera setup, shooting and editing with the most popular HD-DSLR models on the market – including the highly anticipated new AF-100 interchangeable lens camcorder. Industry Certification: Mewshop offers certified training in Apple, Avid and Adobe technologies. Both Apple and Avid certification exams are offered onsite at Mewshop’s NYC facilities. Certification provides industry professionals with official recognition of their skills and a definite way to differentiate themselves to potential employers or clients. Corporate Training: Mewshop offers custom-built corporate training for professionals looking to develop a new skill or build-upon an existing one. From non-linear editing and graphics, to audio, web, and more, Mewshop instructors provide corporations with both on-site and in-house training from beginning to advanced, and everything in between. Six-Week Intensive and Artist in Residence Program: A comprehensive jump-start for anyone looking to advance or launch a career in post-production, the Six-Week Intensive offers certified training in Avid®, Final Cut Pro® and After Effects®, as well as film theory, the history and evolution of editing techniques, aesthetics of narrative, short-form, comedy, and documentary. Students not only learn the tools, but also develop a better understanding of the artistry behind using them. A core component of the six-week intensive, the Artist-in-Residence Program invites top film editors to join the class to screen and discuss their work, while students share their edits for comments and critique. EditFest NY: American Cinema Editors brings you EditFest NY co-produced by Mewshop, the east coast version of ACE’s successful EditFest series – direct access to the inner minds and workings of award-winning film and TV editors. EditFest NY caters to editors of all levels – from students and fledgling editors looking to gain insight and experienced members of the industry interested in the intense atmosphere of creative ideas. Attendees from all over the world participate in two days of sharply planned, targeted panels and extensive Q&A sessions with editing’s brightest minds. Last year’s EditFest featured editors such as Thelma Schoonmaker (Goodfellas, The Departed), David Ian Salter (Finding Nemo, Toy Story 2), Alan Heim (All That Jazz, Network), and more. For more information on Manhattan Edit Workshop, please visit www.mewshop.com or visit us at booth C11022. Manhattan Edit Workshop was founded in 2002 with the goal of providing cutting-edge editing instruction on Apple, Avid, and Adobe platforms. Mewshop's signature Six-Week Intensive is a jump-start for anyone looking for a career in editing; weekend and one-week courses introduce and solidify core-editing concepts. Corporate and group training is offered through a customized curriculum, either in-house or on-site, for professionals that are eager to learn a new skill or to build on existing ones. 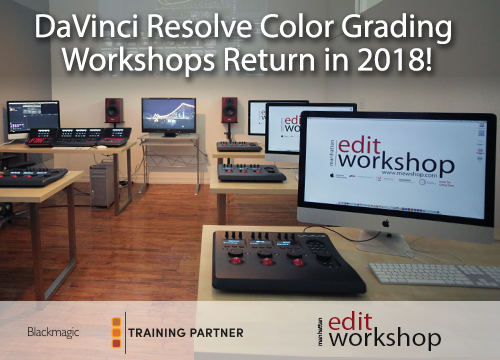 The facility's focus on small workshops, highly skilled and certified faculty, and a results-oriented curriculum, have quickly won it the reputation as New York's premier post production teaching facility.?? *Mewshop offers student loans for courses totaling more than $2,500. Students may take a combination of courses together, or a single course that equals that amount. Please call 212-414-9570 or email jason@mewshop.com for details about our available payment plans. For more information on Manhattan Edit Workshop please visit: www.mewshop.com.